Aluminum Wheel Scraps that we are offering are clean, single-piece, un-plated aluminum wheels of a single specified alloy. They are free of all inserts, steel, wheel weights, valve stems, tires, grease and oil and other non-metallic items. Our Aluminum Wheel Scrap is processed at an ultra-modern vendor’s manufacturing unit. 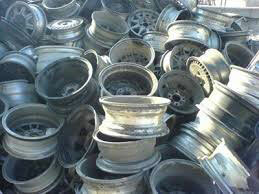 We are a well-known Aluminum Wheel Scrap Exporter and Supplier from Thailand. We make the Aluminum Alloy Wheel Scrap available in various grades and specifications. Being reliable Metal Aluminum Scrap Exporters, we ensure that the consignment reaches the customers on time irrespective of their location across the world. Contact us for placing orders.